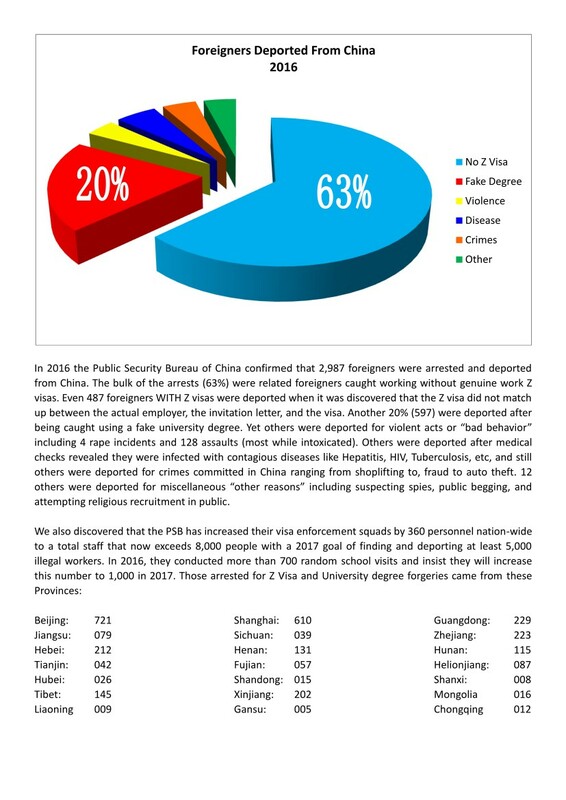 Like a scene out of an old Miami Vice TV episode, China's undercover PSB officers (Public Security Bureau) are scooping up and arresting an average of 180 foreign expat English teachers every week across China in Beijing, Shanghai, Chonqing, Chengdu, Shenzhen, Guangdong, Qingdao, Nanjing, Xian, and six other Tier 1 cities in a clever sting operation. They are hunting down foreigners working in China illegally without a real and legal Z visa which is the required work visa mandated by Chinese law. (1) A verifiable bachelor degree from an accredited university. (2) A valid passport with a Z visa inside upon landing in China. (3) 2 years verifiable teaching experience. (4) Job applicants must be 22-50 years of age. (5) A police certificate proving no criminal record. Because ESL & TEFL teachers get paid far better salaries in Japan, Korea, Singapore, Dubai, etc. China is now suffering a huge shortage of qualified teachers. Thus, shady job recruiters have resorted to selling fake diplomas and bring newbie teachers into China with the wrong visas, exposing them to a 50% chance of detection - and arrest. Those who follow the Chinese visa law have nothing to worry about. If you have any doubts about what you are told by third parties who profit from your travels abroad, you should visit http://SAFEA.gov.cn, and http://chinascampatrol.wordpress.com, or the Chinese consulate in your own country.